The concept " the Great Silk Road " is connected with the historic production and trade of goods made with silks. In more modern eras, efforts have been made in various places to revive these age old silk making skills. Since this revival has relied to a large extent on the use of womens traditional work, it is seen as an important strategy to provide women with much needed income. Some issues, however, arise, including the competition with large scale industrial work, and conflicts over the use of traditional designs. 1) ways the tradition of silk production has been revived. Examples of ways the revival of silk production and weaving has promoted income for women. 2) the protection of property rights of traditional designs.  to what extent is womens historic silk textile work no longer exclusively theirs? Ikat is the process of tieing, or winding and dyeing threads before weaving begins. The pattern of a fabric is dyed into its yarns before they are placed on the loom and woven. Repeated binding and dyeings, coupled with slight shifting of the yarn on the loom, give the designs bold forms. The earliest surviving example of ikat work was found in western China between the fourth and ninth centuries. But it was a short-lived period of cultural renewal in the 19th century that allowed Central Asia to become known for its silk production, mainly of ikat cloth. It was, and is, a cooperative process. Women tended the silkworms, and most spinners were women. Male artisans carried out the rest of the various stages of cloth production. Silk ikat embroidery was the primary place in which women had the greatest freedom in producing designs. 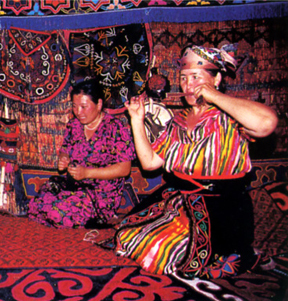  iKAT: Splendid Silks Silks of Central Asia. View the Website: Showing mostly male workers making ikat, but has history and lovely illustrations of the cloth. Suzanis comes from the Persian word for "needle," and the word refers to silk embroidered hangings or fabric coverings. The birthplace of suzanis is in what is now Uzbekistan, where cloth which survives from the 15th century show design influences from the Hellenistic, Persian, and Turkish worlds. 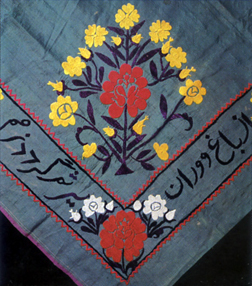 As children, nomad and village girls alike worked on embroidered suzanis as part of their dowries. During the Soviet era, the concept of dowry was discouraged, and suzanis work with it. Recently it has been revived, becoming a commercially produced textile more than a domestic one. View the Website for: Background on the region's history and information on the revival of suzanis work. The tradition of silk weaving in Laos is over 1000 years old. Passed down from mother to daughter for generations, silk weaving continues today as a beautiful expression of an ancient culture. In the past, Lao women only weaved for themselves and their family, breeding the silkworms, extracting the silk, and dyeing it with natural pigments. Now as the demand for Lao silk weaving is growing, it is helping to stimulate a tiny economy with few exports. Afghan women are again making silk-embroidered products, such as cushion covers, curtain, and prayer mats. This website describes an Afganhistan program, helped by the USAID, training women in traditional silkworm raising methods. Study that reveals negative effects of globalization on domestic industries by marginalizing traditional roles of women in the industry. What is typically known as tradition is something that appears to be old, but often has a recent origin or even constitutes a new re-invention. If authentic tradition can be constructed or reconstructed for political interests or, as so often happens, for the sake of tourism, how is tradition to be positioned with the global market pounding at the door? And who owns property rights, thus rights to some royalties, to designs and hand crafted products? How can indigenous peoples around the globe have meaningful participation in the treatment of their own cultural property? The Report presented at the UN Womens World Conference, Beijing, 1995 raised issues of questions regarding the rights of indigenous communties over their knowledge and works of art. Participants from Uruguay, Argentina, Chile, Peru, Paraguay, Colombia and Brazil discussed the ethics of the relationship between those who make craft products and those who develop them for markets. Web Example #3: Is this a Better World? An Australian organization Better World Arts, connects two conflicting problems of ownership rights, and finds a mutual solution. Comments to the post pose additional views. One page description of creation of a sister school relationship between traditional artisans and designers over a product made for children. in the book and movies in the Twilight series. Merchandise labeled as being from the Quileute Peoples in the books and movies from the popular Twilight series has not recognized the possible rights of the real Quileute Nation, a small group located on a remote reservation in Washington. In the United States, the most significant federal law that addresses the marketing of Indian cultural goods - the Indian Arts and Crafts Act, passed in 1935- is meant to ensure truth in advertising, that Hopi kachina dolls, for example, must be Hopi-made. But it does not come into play for the Quileute hoodies, jewelry and other goods sold, because there is no claim they were ever traditionally made by the Quileute. Questions: Should the Quileute be able to have a say in and benefit from outsiders using their cultural property? What types of rights were deemed important to be protected in 1937? Can these be applied to todays property rights issues? If not, what future action might be taken?  Quileute Indian Tribe Reservation Charter, ratified August, 21, 1937. Embedded in Charter are list of federally granted rights. Many pertain to economic rights. An opinion article in the Febuary, 7, 2010, New York Times, by Angela R. Riley, Director of the American Indian Studies Center, UCLA.